We do documents, forms and labels. And we do them better. Eclipse’s founders have been focused on enterprise-class form, document, and label software solutions for more than 20 years. Our team was involved in the creation of some of the most successful forms software solutions in the world. So it made sense when we founded Eclipse that we focused on the one business where we had extensive knowledge of the industry. The enterprise forms market is a mature market. The forms software that most customers use today is obsolete; in many cases, it may even be sunset. When we created DocOrigin, we used all the experience we gained from creating products like JetForm – Adobe Central, LiveCycle, FormsPlus/400 and StreamServe and built DocOrigin from scratch. So we started with a clean slate, learning from the errors made in previous products. With all of this wisdom and the knowledge of current trends and technology, DocOrigin is the top-of-the-line Customer Communications Management, forms, documents, labels and checks solution. 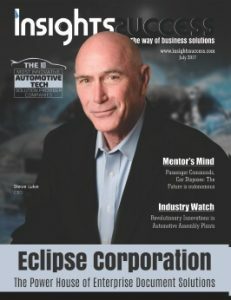 Eclipse CEO Steve Luke was featured in the August 2018 edition of “Insights” magazine. These companies replaced aging forms software with DocOrigin or our Business Communications Center! Call us so we can show you the value for your company! More than 3,000 Licenses installed in the last 5 years! Eclipse Corporation offers a full range of software solutions for all your document design and automation needs – built from the ground up by the team that developed Adobe Central and JetForm. As pioneers in the enterprise document automation industry, the Eclipse team has the knowledge, experience and track-record your company can rely on. Let us show you how easy it can be to modernize your company's customer communications to take advantage of cutting-edge marketing tools – and provide our powerful proprietary Integration Without Modification™ software feature in all our software solutions! Don't change your business software, change your forms software to DocOrigin! !